The party’s National Executive Committee, which met in Abuja early Friday, had mandated the party’s 22 governors to meet with the Senate President and the Speaker of the House of Representatives in a bid to resolve the dispute between the party’s rival groups. The Rochas Okorocha-led PGF met for the first time with feuding party members in the National Assembly in Abuja on Friday. 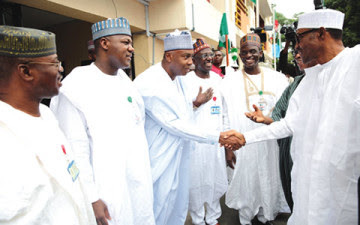 Senate President, Bukola Saraki; Speaker of the House of Representatives, Yakubu Dogara; Senator Ahmed Lawan and Femi Gbajabiamila, who are the APC’s preferred candidates for the positions of the Senate President and Speaker respectively, attended the meeting. The meeting, which was held at the Imo State Governor’s Lodge in Asokoro, Abuja, was sequel to a directive by the party’s National Executive Committee for the governors to work out modalities to end the crisis at its meeting on Friday. Saturday Punch learnt that the governors had told the party’s chieftains that the crisis should be left for them to resolve. A National Assembly official, who confided in Saturday PUNCH, said that on the request of the APC’s governors, the NEC did not bother to discuss the issue at its meeting on Friday. Investigations showed that the governors and the APC lawmakers at their meeting considered proposals by some party chieftains on ways to end the crisis. The proposals, it was learnt, included a plan that those who lost out in the race for the National Assembly leadership should be allowed to chair their preferred committees. It was gathered that the rival groups had not agreed on terms for truce as of the time the meeting was adjourned till Saturday. It was learnt that Dogara and Saraki were not favourably disposed to the proposal, particularly sharing of leadership positions, which had already been announced in the Senate.